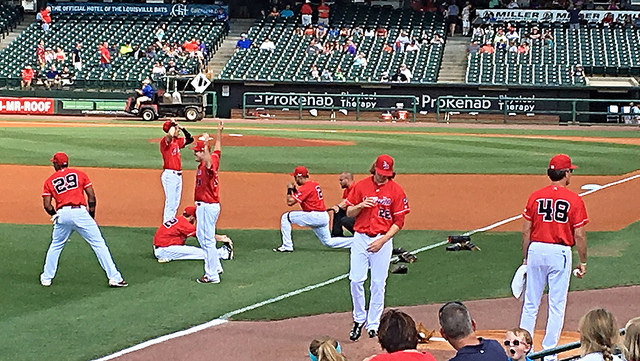 Louisville Slugger Field-Louisville, KY: Well, first off this Father’s Day was all around a good one, but things simply didn’t go as planned. The first thing to not go as planned, was the notification I received from the Bats that game time was 6:05. Sunday games are usually at 2:05, and I’m not sure when they did the switch or why. 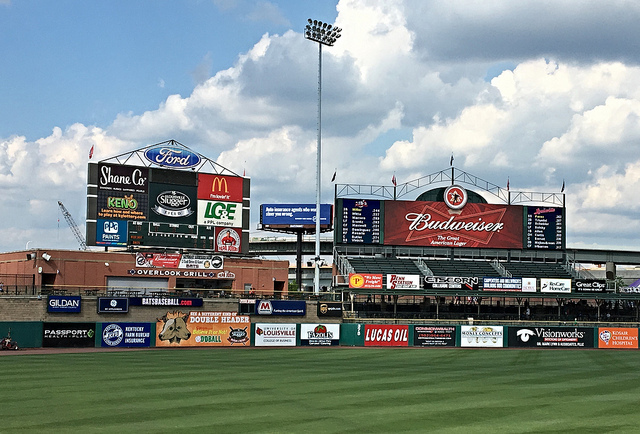 If it’s because we’ve been battling 90 degree plus heat, then I do understand, but it messed with our plans as Brian had a baseball practice slated for 6:00, and we had planned to go to Kentucky Kingdom afterwards. If this was any other day, I would have cancelled our trip to the game, but this is Father’s Day, dammit, and I wanted to see some baseball! 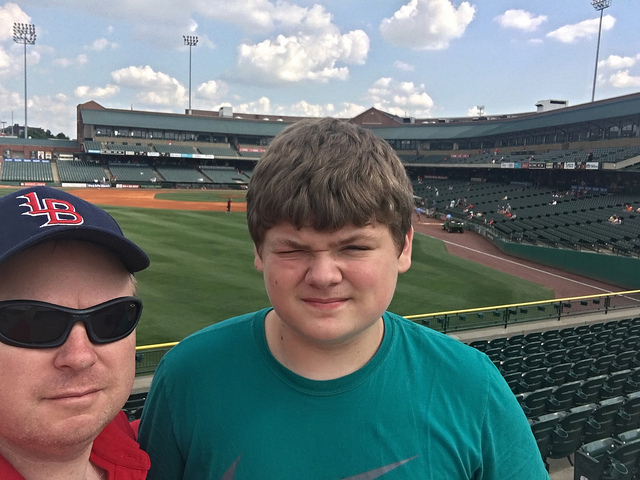 Brian’s mom and sister agreed to take him to practice, and Trevor and I headed to Louisville Slugger Field. And…I’ll take the kids to Kentucky Kingdom some time this week. I promise. For our second speed bump, you’ll notice how crappy my photos are, and that’s because I left my good camera in the van, and you’ll just have to suffer from the below average iPhone pics. It was another hot day in the ‘Ville, as Trevor and I settled in, but it was an entertaining back-and-forth ball game. 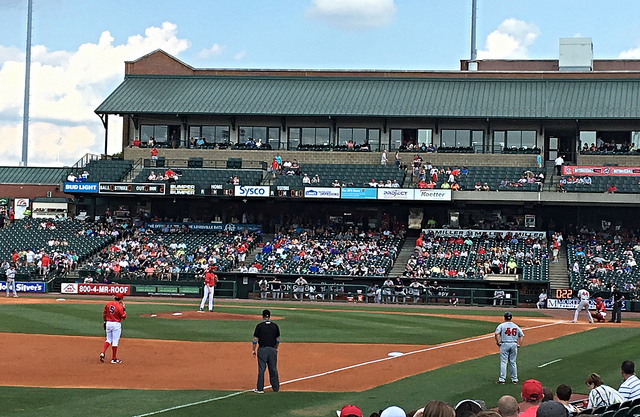 The Bats took a 1-0 lead in the first, as Scott Schebler hit a towering dinger into the left field stands. The PawSox battled back, however, tying the game in the third, and then hitting a home-run of their own to take the lead. It was the Bats turn to regain the lead now in the fifth, on a Juan Perez RBI double, and a Jermaine Curtis home run. On the mound, starter Stephen Johnson went five innings, giving up two runs on four hits, while striking out three. Surprisingly, it was relief pitcher Jumbo Diaz who took the loss, giving up two runs on three hits in one inning of work. Diaz had a franchise record going of 35 2/3 consecutive innings without giving up a run snapped. 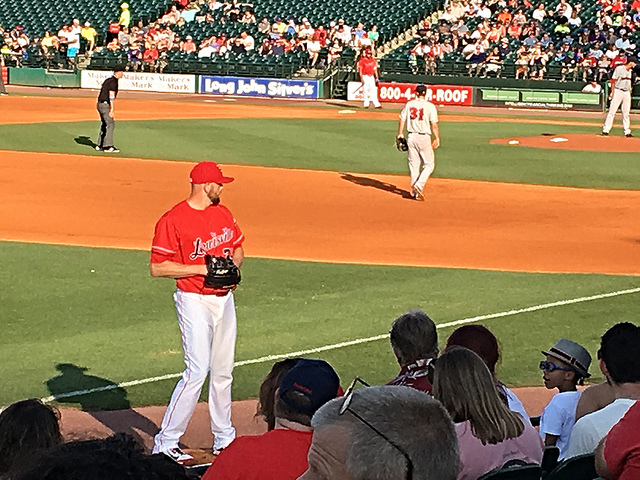 Well, aren’t we just good luck… Making a rehab appearance was Michael Lorenzen, who pitched a scoreless ninth inning giving up no and striking out two. FINAL: Bats 4, PawSox 5. Your photos are great, as usual. Thanks for sharing. Thanks, I appreciate it! Next game the pics should be better, unless I forget the camera again!